Are you cool and attractive enough to handle Strong Bad's style on WiiWare? Telltale Games have been developing some of the most prominent and downright hilarious adventure games of the past several years, while Homestar Runner has been responsible for one of the most popular and ridiculously enjoyable Flash cartoons of this millennium. It may seem fate, then, that these two forces would one day collide to produce the most offbeat adventure game in recent memory, but not even Nostradamus could have predicted the result would be titled Strong Bad’s Cool Game For Attractive People. But here we are playing the green-eyed, glove-fisted former villain’s groundbreaking WiiWare release, Strong Bad Episode 1: Homestar Ruiner, on the assumption that we, too, are cool and attractive. After repeatedly harassing Telltale Games to release some of their first-rate adventure games on the Wii, such as the excellent Sam & Max, it seems like a dream come true, even if no one in his or her right mind was dreaming of a game based on the Homestar Runner web comic. 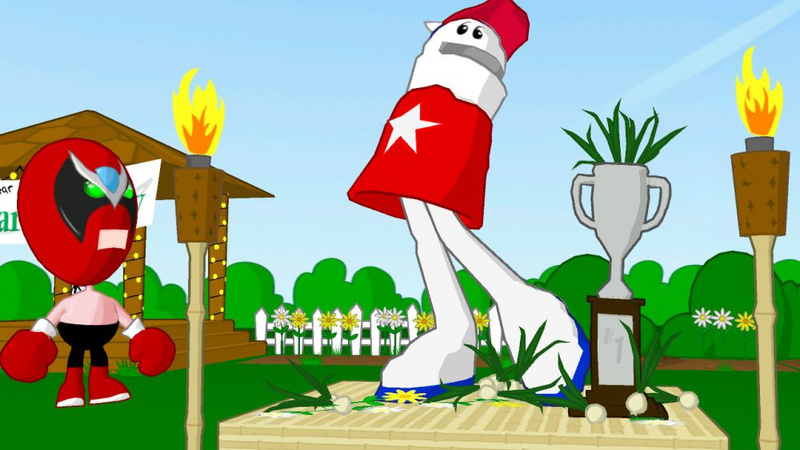 As the most popular Flash cartoon around, Homestar Runner has prospered as a discreet operation with a certifiably cult following. It’s set in Free Country, USA - just your average American town, complete with a derelict drive-thru speaker that offers profound insight, a concession stand that sells everything from pretend candy to lawn-mowers, and a castle inhabited by its ruler and his personal Poopsmith. The cartoon generally follows the frolicking adventures of Homestar Michael/Hal Runner, a dim-witted star athlete, and his group of friends and acquaintances, such as his on-and-off-again girlfriend Marzipan, his best friend Pom Pom, and the Brothers Strong. Collectively, their escapades hark back to a time when all cool and attractive kids scribbled their own derisive comics, made sound effects while playing awesomely crude videogames, and positively tormented their younger brothers. In fact, if you grew up in the late '80s-early '90s then your imagination likely concocted adventures similar to the ones in Homestar Runner, and in those imaginary fantasies every boy was Strong Bad. Not unlike The Simpsons, in which most episodes focus on the antics of everyman Homer Simpson while every kid who grew up watching the series knew that his son, Bart, was what made the show cool, Strong Bad makes Homestar Runner look bad. He’s the complex kind of guy who gets off on playing pranks on anyone less freakishly awesome than he and fancies himself a bit of a criminal mastermind, but isn’t above appreciating the joys of soaking in a bubble bath or a good old-fashioned session of dress-up. He’s a short and stocky dude with a luchador mask for a face and boxing gloves for hands, but in his mind his muscles are so bulging that his styles are left no room to hide. In reality, he’s a bullish nerd whose sarcastic wit, combined with an extensive use of simple, often demeaning adjectives, has conspired to make him the most popular character in the cartoon, not to mention the obvious choice of protagonist for a videogame adaptation. Strong Bad’s daily life revolves around checking email on his Lappy 486, playing Videlectrix games, drawing Teenage Girl Squad cartoons and playing pranks on anyone who gets in the way of his styles. Accordingly, much of the gameplay in Homestar Ruiner revolves around such activities. Each episode will include a retro-styled videogame (Snake Boxer 5, in this case) as well as an original TGS comic and a load of emails. These all prove to be enjoyable, if fleeting, hobbies that establish congruency and meaning in Strong Bad’s '90s-obsessed lifestyle. Potentially, if they properly build upon these activities in future episodes, they could establish a remarkably relatable yet satirical character that is practically unheard of in most current videogames. As it stands, they are the epitome of fan service at best and mildly amusing diversions at worst. Beyond encouraging you to embrace your inner Strong Bad, Homestar Ruiner’s overall plot and progression are structured like an interactive cartoon and that’s essentially what the game is as a whole. The progression is strictly linear and, honestly, could only occasionally be referred to as proper gameplay. Most, if not all, challenges are a mere case of connecting the dots or following a vague series of steps to advance the story, which isn’t even as easy or intuitive as would seem due to some rather ambiguous objectives. Truthfully, much of the game involves clicking on everything possible and trying to find a use for all the “surprisingly useful, useless crap” through trial-and-error. Towards the end there are a few decent puzzles, but their solutions follow that similar confounding pattern. This is compounded by the fact that the game’s pacing relies heavily on the haphazard nature of the cartoon. While the writing is certainly strong, this episode might follow the cartoon a little too closely in that you’ll often wonder if you’re watching a game or playing a cartoon. Part of this is a testament to Telltale Games’ ability to recreate the look and feel of the cartoon itself. The graphics approximate the 2D look in a 3D environment about as well as possible and everything from the voice acting to the pleasant, low-key music is straight out of the web comic. However, the stilted pacing and vague gameplay may leave you wondering if you’d be better off just watching the cartoon in the first place. Moreover, if you aren’t a fan of the genre, then this episode will do little to convince you - and if you are, then it will do even less to surprise you. As a whole, SBCG4AP has the potential to be a hilariously offbeat rendition of a dying breed of videogames. Assuming Telltale Games expands the reach and scope of the gameplay in each successive episode, they will have a cult hit on their hands if indeed they don’t already. Unfortunately, the first episode doesn’t definitively establish itself as a proper videogame as much as it is a charming adaptation of the Flash cartoon. As well as Telltale Games did at offering a tremendous service to fans of Homestar Runner, they are only occasionally able to prove that playing a cartoon is better than watching one. Finally, you're later than usual with this review. 7/10 is a reocurring theme around here it seems. Unlike many other sites out there, we reviewed the actual WiiWare title as opposed to the PC version. And as for the '7' score being so common - that's the fault of the games, not us! Yeah, good review. It wasn't the best wiiware game yet. 7/10 is fair. It wasn't hilarious. The gameplay wasn't great. Movement is annoying. I am constantly trying to go right, and I go left. I wish there was nunchuck support. There wasn't a boatload of emails. Just one TGS comic. It would have been better for a couple bucks less. I don't think of this as a comic rather than a game; and comics are not worth 10 bucks (especially when you can go to the local comic store and get 2 for that much). And look at all those blocks! All WiiWare games that I own so far got a 7 from you guys. Maybe every WiiWare game that I will be interested in will get a 7. But the comics are interactive, you choose what happens next, and that wasn't the reason I thought it should be cheaper. Great review. I think I'll be passing on this one. Not my cup of tea. Well, I´ll just get Star Parodier instead. I'm gonna delete it once the second one comes out. Was that a review of the game or the cartoon? I think I read one paragraph that outright screamed game. I like point and click so I'll be getting this asap. Thanks for the spot-on review. I was very excited about this and got it as soon as it was available for download. 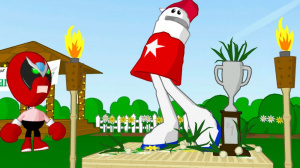 I'm a fan of Homestar Runner, though my interest has dropped over past year/year and a half. I was hoping this game would restart my interest but so far it just seems a little boring with not a lot to do or explore. I also get a little bugged everytime I'm done playing snake boxer in Strong Bad's room and it flashes to his lappy computer room while the game saves. It seems like the developement team pushed this one out too quickly...before fixing all the little glitches. For me, 6/10. Should have waited for the review. i figured this game wasn't my type and this review just confirms it i'll stick with watching the cartoons for FREE. Well this game wasn't my cup of tea in the first place. But it was a solid review on the game and I will be waiting for Mega Man 9 to be my first Wiiware game. Still gonna get this awsome game some time in the near future. I will have to delete each old episode every time a new one comes out and untill we have a storage solution, we need a storage solution even more now that these episodes are so big. I don't have much to compare it to as I never played a point-n-click adventure before, although I will say that I'm totally buying Sam and Max for the Wii now! I'm a lapsed Strong Bad fan and I can't be bothered to watch more of the cartoons very often, but I tried the PC demo and promptly bought the game. I'm having a lot of fun with it so far and I'm about half way through (I think). I think this is a good game if you like this sort of gameplay and the humor. So it's a bit hit and miss, but I think more hits than misses. Right now I'd give it an 8. Anyone who is on the fence, PLAY THE PC DEMO! Even if don't think you want it, play the PC demo just to check it out. Telltale deserves some love for this. Games are supposed to be more like, well a video game than a storybook. @Bahamut ZERO: That's fine. I actually like this sort of interactive story thing. Which is why I'm going to be picking up Sam and Max season 1 for the Wii really, really soon. And there are puzzles to figure out, like what stuff to use where and when. So it's not just walk here, click to talk, walk there, repeat. Sound pretty good. I will probably get this. Overall, I found the game to be pretty clever and funny despite the fact that I haven't visited the site in... what, years? Even worse, I still caught many of the references! Ten dollars is pretty cheap for something like this, too, so it really is no loss for me at all. Good review. It's a fun game and pretty funny. I found myself laughing a lot throughout the game. I'd played Sam and Max before so I knew what to expect with this. I actually haven't played a point-and-click game since the original Myst, and I got incredibly lost in it. Maybe it's due in part to the laugh-out-loud humor of H*R, but I enjoyed this. Here's what I thought of the game. Took me about three and a half hours. Not bad for $10. I'm sure another playthrough would go a lot quicker now that I know what to do, but at the same time, I didn't 100% the game. Those moments where I wasn't quite sure what to do weren't very fun (as expected from a game like this), but when things started coming together, I couldn't help but smile at what I knew was about to happen. Definately enough laughable moments (found myself rofling at the photo booth for some reason). The game had a few "goofs" typical of the H*R cartoons, which I guess means the game had a few glitchy spots, but none of them really detracted from the game. Music, a lot of it came straight from the series, which I think is good. Some of the voices sounded a tad different, but if the Quote feature at homestarrunner.com is any indication, that's merely due to the sound being better quality than what's available in Flash. And you still gotta give them credit: you can't really tell that almost all the voices are performed by the same guy. Overall, it was an enjoyable experience, and I don't really play point-and-click games. Looking forward to the next epi-snowed. It's funny and makes a great story, I personally want a more complete "gaming" package for my 1000 points. I think 7 is correct score. But dang there are so many 7's. i know this is off topic so you can delete it when you finish reading it but you should proabably check out Luc's blog theres a nice surprise in his newest blog. can you actually play trogdor or is the arcade machine just there to annoy you? If you like this game and want to try other point and click adventure games, try the PHOENIX WRIGHT series. I look at these games (point and click, not just PW) quality different than normal games in that they are more based on the story than the gameplay. @Review. Very good but it had too much explaining the background (still important) than the strengths/weaknesses of the game itself. And I was curious you didnt mention the freezing issue. Did it not happen to you all? I'd like a little less info about the show, and a little more about the gameplay. I understand that its a point n click, but is there an inventory? How long is the game? It seems that there are several comments on the score of 7. I'd just like to point out that there isn't a standard scale by which a game is scored. Reviews are personal opinion pieces. I've been keeping up with some major game news sites for several years now, as many of you do I'm sure, and I've seen numerical values essentially lose their value. A 7 can mean something different to every person. Some gamers see it as average, and others see it as good. Yet, some gamers will buy a game that got a particular review score and see it as better or worse than the person who reviewed it in the first place. I played through the game to its entirety and never experienced the freezing issue once. I have all the trophies, cards, and manual pages as well. No problems here, whatsoever. As far as the score goes, I actually strongly considered giving it an 8; however, the reality is there is so much more they can accomplish in the later episodes that I had to leave some room from improvement. This is a solid first entry, but as the series continues, it'll be interesting to see how the gameplay evolves and grows. I spent so much time explaining the show because I have to assume that the average reader has no experience with it. Also, the game relies so heavily on the appeal of the cartoon--it's essentially an interactive adaptation. If you don't like the show there is little chance you'll find much enjoyment in the game. Moreover, there just isn't that much in the way of gameplay to talk about. The whole game revolves around clicking on stuff to either interact with it or add it to your inventory (yes, there is one) so you can find a use for it. It's all incredibly linear and potentially boring if you aren't interested in the source material. Finally, length depends on a lot of factors: how long you take to figure out the puzzles, how much you enjoy walking around talking to the various characters, how much time you spend on the extras, etc. I really don't like making such assumptions, but I guess you could say the story is about 3-6 hours long. However, I don't think you can quantify the value of the game by how long you spend playing it so I try to avoid referring to a game's length unless it's a significant issue. Rest assured, in this case you get plenty of game for 1000 points. Definitely a must-have for the Homestar Runner Fan. You may even like it if you loved the Point-and-Click adventure era and long for a game like that. I've been playing it for about 3 days (I don't keep track of hours) and have cleared the story, but according to the "How Awesome I Am: A Chart" I still have lots more to find! Yes, there is an inventory. I need 2 TGS cards, 2 trophies and 1 clothing item before I get everything. Some of the puzzles are kinda annoying, it kept me up at night trying to figure out what to do. (Which I did) You never really know what to do, sometimes you get hints from Strongbad but they aren't that helpful. Scores are more of a novelty to me anyways, I like to see them, but they aren't important. As for the review, there wasn't much left to talk about - it's a point 'n' click(which is generally an interactive story/cartoon with some puzzle solving involved) based on a flash cartoon, if you've played one before, you have a pretty good idea of what it's going to be like. The reviewer did do a nice job conveying what little gameplay there was. Personally, I like point n clicks, so long as the story is humorous, and I've watched a little of Homestar Runner, and I thought it was pretty funny, so I'll probably get this. I agree with you completely. 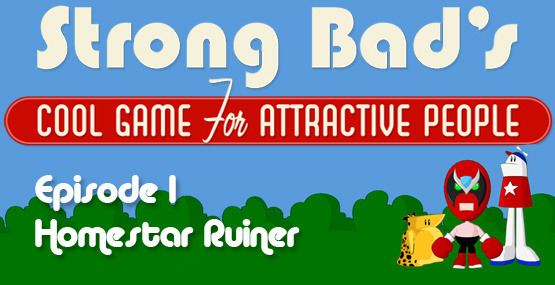 If you don't enjoy Homestar Runner, you probably won't like this game. I actually laughed out-loud pretty consistently throughout the entire game. The puzzles aren't mind-numbingly difficult, but they all make perfect sense. You don't have to combine a half-eaten donut and a clothes hanger to make the key to a dresser in a room you were in 5 hours ago. All together, it's a simple point-and-click adventure that is very entertaining if, as ACK! said, you enjoy the source material. Also as Naturestee said, if you are undecided about buying the game, download the PC demo! That's what made me want to get it! I played the demo for about 5 minutes and they already had me laughing. The way it's written is so unlike any other point-and-click game I've played. It's very authentically Homestar. I am really looking forward to this game comming out in Europe. I have played the free PC demo and I love it! Too bad Nintendo dont allow demo's for WiiWare. Good review Alex, you pretty much summed up my thoughts exactly. I am a Strong Bad 'virgin' so after downloading this I wasn't sure what to make of it at first. Once I started to get to know the characters however I found myself enjoying it. The 'point and click' game mechanics were never going to set the world alight but in Strong Bad's universe it is very charming and it does feel as if you are in the cartoon. Roll on episode 2. I can't wait to see where they take the series next. I thought this was a good review. I really needed to be filled in on the backstory of the characters. So excellent review even though I don't think this game is for me. While i played the PC demo, i do admit that while it was great, it wasn't brilliant. I also had a little control trouble and it did seem a bit confusing. Thankfully, these sorts of things can be worked out in Episodic games and i hope they will. Im not sure about this it could be fun but its short and when youre done the whole purpose of funny fades away because it gets old. @WaddleWave: No trial and error? Respectfully, hell yeah there is. Good score overall. Highly recommended for H*R fans, recommended for point-and-click fans, everyone on the fence should play the PC demo. Some of these puzzles were more intuitive to me than others, some just seemed completely random, so I think trial and error is a apt description. Not such a bad thing, it just goes with the territory I suppose. Hey guys, the Game is now number one on WiiWare as of 9am Thursday Pacific Standard Time. Now that is a first. And Dr. Mario is in 4th. This is a mighty upset indeed. I'm glad SBCG4AP is succeeding so well. I'm excited for the next episode and hope more come after the season is done. While I do feel there is a significant amount of trial-and-error involved in some of the puzzles, that's not necessarily the reason it got the score it did. Basically, if you don't like Homestar Runner and/or Adventure games then this is one incredibly boring game. My score has nothing to do with fanboy anything (coming into the review I had little experience with Homestar Runner, actually). It's the opposite, really--if you aren't a fan then what does this game offer? Look at it this way, if you don't like the humor, the characters, or the story there is simply not enough gameplay to carry the game. It's fun because it's funny. And I'm going to avoid talking specifics to prevent spoiling the game for others. Sorry if you disagree with the review, but I think you need to re-read it if you honestly think I sound like a raving fanboy. I have to agree with your review and your #44 comment, ACK! I was a fan of Homestar back in High School and Post HS years and this was very enjoyable for someone who has watched it for a while. I think people need to remember that 7's are not bad reviews. As MasterMario stated in comment #5; all of his WW games are rated as 7 on this site. Seven is an above average game. Not great, perfect or marvelous (to use DDR rating) but they are still good. Keep up the great reviews. I appreciate them. Thanks for the feedback and support, Stratos (along with everyone else). We really appreciate it. And you're exactly right. A score of 7 is a fine score given to good games that either have minor flaws, limited appeal, or simply lack enough content. here is the link to the game on the Homestar site, but the arcade game never works in the game. The limited content is a tough one on WW because I bet the episode would have had more material if space wasn't an issue. SBCG4AP is already the largest WW game I've DL'd. Some people really knock Lostwinds for the same issue. Even though it's twice as expensive as the PC version in Europe, I'm still going to buy it. 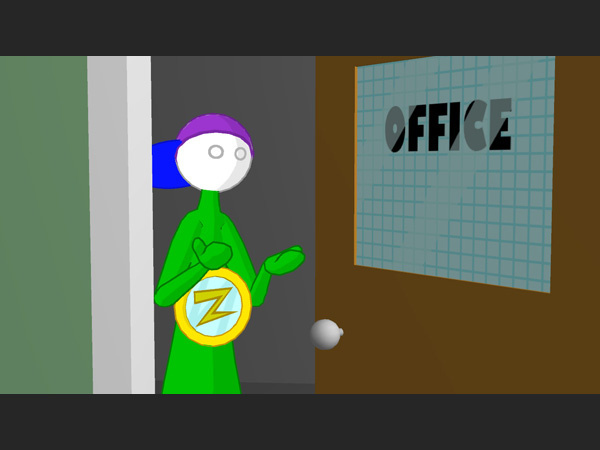 I've never seen any Homestar Runner comic or flash movie before but I really liked the humour in the demo and am a huge TellTale fan. You still shouldn't buy this for the puzzles since they were (in the demo, at least) pretty mediocore compared to most good adventure games. SBCG4AP is the biggest thing you can download! Yeah, if you don't know what Homestarrunner is or aren't a fan, this isn't the game for you. After reading your review again, I have come to fully agree with your score. Although it's a good game, it's still a bit limited. Future episodes will most likely mend that. And if SBCG4AP is the largest so far it makes you wonder how many blocks it takes to hit the limit of 44MB. Especially since FFCCMLaaK is around 287. It makes me want to go count how many blocks all of the add-on content for FFCC is and if it equals 319 or so. Because if that is the case then Square really pulled one over us because it could add to the theory that they held back stuff on purpose. Looks like MLaaK planed the DLC to be 1/7 of the full game's size. That would mean about 334-335 blocks for total space. But you have to include basic system files that take up part of the max. Someone else probably has more knowledge on it or has done the numbers already. I beat the game in 2 days and I'm only missing a few things. 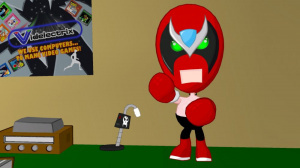 When I had Strong Bad wear a blue shirt from the photo booth, blue appears on the screen in enviornments when I was in track and outside of House of Strong. Overall, I can't wait for the next episode. MLaaK file size does not go up when you download DLC. when i downloaded some the size was still 287. Now I beat the game 100%. But do you notice the second save file on your Wii for DLC associated with he game? Mine is currently 10 blocks for a couple items. @#42 Dazza-Have you played Myst, any Adventure Company products, Sierra, Lucas Arts, Dynamix or any free adventure games before? Myst is the biggest trial and error adventure game. It suffers (yea I said it, its true) from the biggest vague game play ever that you can find in any adventure title, also item finding plague its beautiful graphics. That being said it looks like a lot of you have not played adventure games before. I do not agree with this review. It doesn't explain in detail the lows of this game, heck, I find Kotaku's short reviews more detailed because they go literally straight to the highs and lows of the game. I have been playing this game with no hints and I have been doing fine and liking it while solving puzzles. I really love its humor and have not seen the comics prior playing this game. Its humor is like a take on Laurel & Hardy, mind you not the genius of it, but the relationship between them. 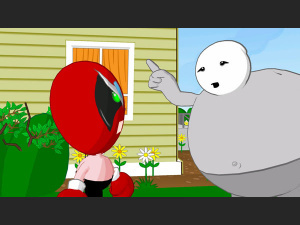 Strong Bad (your main character) could be the fat one but evil and brute, Homestar could be the thin one who is dumb but in this case talks a lot. The shower puzzle is no trial and error. You have to listen to the audio clues given by the characters. The costume puzzle also, the main character (Strong Bad) gives you clues as to how to solve it. King's Quest V time puzzles and strange devices in the castle, in one of them you have no idea on what to do next and the answer was to wait? A very funny game, too bad fanboyism had to surface. Giving gameplay score being compared to a non playable media even though the game in itself its really funny is sad. People really, this game comes from the good folks who remade Sam & Max. If you did not like that you will not like the game, otherwise its really good. @Smash Eggs & Garlic - I have to admit to not having played too many adventure games on the whole. I agree none of the puzzles are too cryptic in this game, but they are not all immediately obvious either. I don't agree than fanboyism has contributed to a less than perfect review here. What brand of fanboyism would this be anyway? Anti-adventure games, anti-Strong Bad? Surely a fanboy would be in favour of something, not against it? The main point you are missing is that a 7/10 is considered to be a "good" game. This review is on the whole a recommendation as I see it. Perhaps you are a fanboy? The only real thing from holding me and my points back from downloading this is the memory problem. I know that I can delete some stuff, but right now there isn't anything I want to delete. I had to delete the internet channel for enough room for My Aquarium earlier today, but now I simply can't bear to lose anything else without redownloading the internet channel straight afterwards. Nintendo will pay for this. Oh yes. THEY WILL PAY!!!!!! Finished this today although I still need to get all the trophies and such. I think the score of 7/10 is fair as the gameplay side can definitely be improved on. I personally found the game pretty easy, which is quite something considering how easily I get stuck on point and click games! I enjoyed it overall though, being a Homestar Runner fan, and I look forward to the next episodes. As long as the quality of the writing and characters stays equally good and the gameplay becomes more challenging! Also after finishing the game I can't talk to Coach Z without the game freezing on me. Turning the Wii settings to 4:3 seems to correct the issue however. Here's hoping they send out a patch soon. ACK! and the others pretty much explained SBCG4AP: Episode one. I liked it too, but then again, I'm a Homestar fan. A bit short, but funny. It is glitchy too, sometimes it even hurt the game (i.e. the Poopsmith didn't move after one point in the game, a hole looked covered but the animation really wasn't supposed to be there). I don't regret my purchase though (second best of all my WiiWare games). 7 out of 10 sounds about right. It's a good game, but not phenomenal. It's certainly likely to entertain any Strong Bad or point-&-click fans. But it's not going to change the mind of someone who dislikes of Homestarrunner.com's humor or the genre. And gamers looking for a stunningly presented game--something that really establishes itself as above and beyond the web cartoon--are going to be disappointed. A plus of the "episodic" format is that Telltale games will have the opportunity to take some of this feedback into account for future episodes. I don't know how far along they are with the 2nd episode, but I can't imagine they are already done with the 3rd, 4th, and 5th--and one hopes they are capable enough of tweaking completed, unreleased games for really important things. Like, I dunno, that there freezing-on-widescreen-display issue. It seems that every copy of SBCG4AP has the freezing issue. After completing the story, just talk to Coach Z, your Wii WILL lock-up. (You can apply items to him, you just can't talk to him without an item in your hand.) Different outfits don't seem to have any effect. Am I missing something? I know it was mentioned in an earlier post but if your on the fence about this game try the PC demo for free. I never tried a point and click game and so far I think its pretty good. ALso I think Nintendo should use one of it channels for short cartoons and such. Maybe they could show Strong Bad, or old cartoons of Captain N, Zelda, Mario, or something exclusive. I'll just get the free PC version. This ain't worth the space on my Wii, despite my childhood love of point and clicks. Good review, although I might've given the game an 8, but then again, I'm playing it through my rose-red fanboy glasses. I think that this is the best wiiware game out right now, so don't worry that it only got a 7. The episodes will no doubt improve later on. I just got started with the series yesterday and I'm glad I did. Awesome game. Can't wait to get all the extras and stuff.